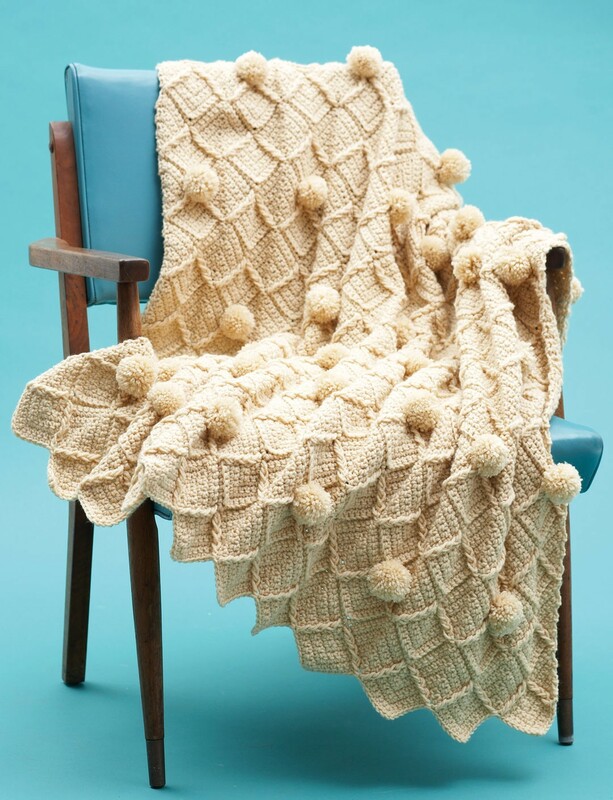 Today’s Free Pattern Friday is exactly what I need in my life right now – a cozy crochet afghan! This fun and festive pattern is brought to you by our friends at Yarnspirations. The cabled design gives this afghan a unique texture, while the pom-poms are an easy touch that adds so much personality! Toss this throw over the sofa and all of your guests will be talking about it. Have a blast working up this free crochet afghan pattern, and have a great Friday! 12 sc and 13 rows = 4″ [10 cm]. 1st row: (RS). 1 sc in 2nd ch from hook and each of next 6 ch. *3 sc in next ch. 1 sc in each of next 7 ch. ** Miss next ch. 1 sc in each of next 7 ch.Rep from * 10 times more, then from * to ** once. Turn. 2nd, 4th, 6th and 8th rows: Ch 1. 1 sc in first sc. Miss next sc. 1 sc in each of next 6 sts. *3 sc in next sc. 1 sc in each of next 7 sts. Miss next 2 sc. 1 sc in each of next 7 sts. Rep from * to last 9 sts. 3 sc in next sc. 1 sc in each of next 6 sts. Miss next sc. 1 sc in last sc. Turn. 3rd row: Ch 1. 1 sc in first sc. Miss next sc. 1 sc in each of next 5 sc. *Dcfp around next sc 1 row below. Miss next sc behind st just made. 3 sc in next sc. Dcfp around next sc 1 row below. Miss next sc behind st just made. ** 1 sc in each of next 6 sc. Miss next 2 sc. 1 sc in each of next 6 sc. Rep from * 10 times more, then from * to ** once. 1 sc in each of next 5 sc. Miss next sc. 1 sc in last sc. Turn. 5th row: Ch 1. 1 sc in first sc. Miss next sc. 1 sc in each of next 3 sc. *Dcfp around next dcfp 2 rows below. Miss next sc behind st just made. 1 sc in each of next 2 sc. 3 sc in next sc. 1 sc ion each of next 2 sc. Dcfp around next dcfp 2 rows below. Miss next sc behind st just made. ** 1 sc in each of next 4 sc. Miss next 2 sc. 1 sc in each of next 4 sc. Rep from * 10 times more, then from * to ** once. 1 sc in each of next 3 sc. Miss next sc. 1 sc in last sc. Turn. 7th row: Ch 1. 1 sc in first sc. Miss next sc. 1 sc in next sc. *Dcfp around next dcfp 2 rows below. Miss next sc behind st just made. 1 sc in each of next 4 sc. 3 sc in next sc. 1 sc in each of next 2 sc. Dcfp around next dcfp 2 rows below. Miss next sc behind st just made. ** 1 sc in each of next 4 sc. Miss next 2 sc. 1 sc in each of next 4 sc. Rep from * 10 times more, then from * to ** once. 1 sc in each of next 3 sc. Miss next sc. 1 sc in last sc. Turn. 9th row: Ch 1. *Dcfp around next dcfp 2 rows below. Miss next sc behind st just made. Working in back loops only, 1 sc in each of next 6 sc. 3 sc in next sc. 1 sc in each of next 6 sc. Dcfp around next dcfp 2 rows below. Miss next sc behind st just made. ** Miss next 2 sc. Rep from * 10 times more, then from * to ** once. Turn. 10th row: Ch 1.Working in back loops only, 1 sc in first st. Miss next st. 1 sc in each of next 6 sts. *3 sc in next sc. 1 sc in each of next 7 sts. Miss next 2 sc. 1 sc in each of next 7 sts. Rep from * to last 9 sts. 3 sc in next sc. 1 sc in each of next 6 sts. Miss next sc. 1 sc in last sc. Turn. Rep 3rd to 10th rows14 times more, then rep 3rd to 9th rows once. Wind yarn around 2 fingers 50 times. Tie tightly in the middle and leave a long end for attaching to Afghan. Cut loops at both ends and trim to form pompom. Sew pompoms as shown in Diagram. How do you like to embellish your afghans? 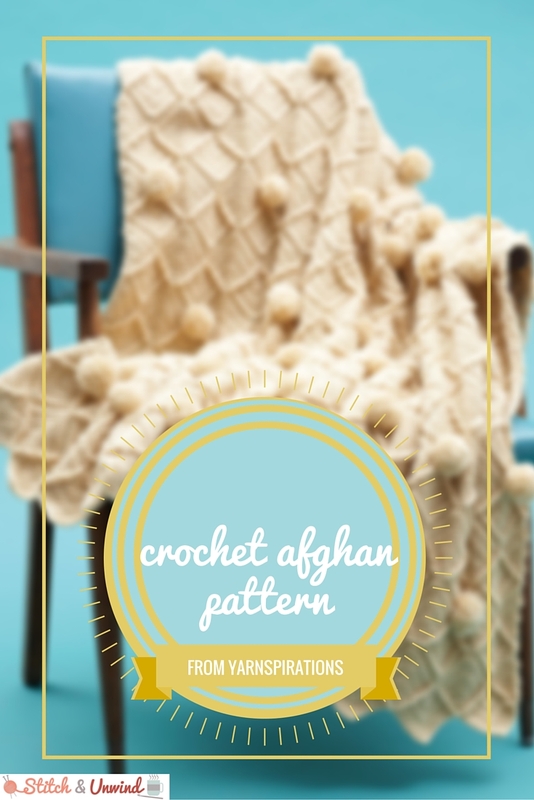 This afghan can be crocheted without the pom poms and it will still stand out because the ridges give it a classy appeal. This can be produced in the color of yarn you want. The pom poms can be made in contrasting color with the afghan or it could be the same as the afghan itself. 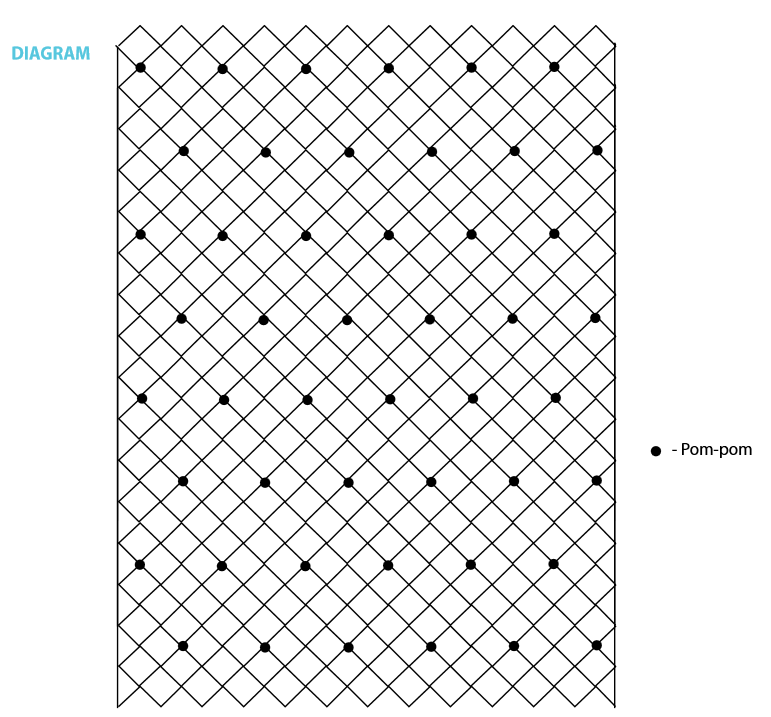 Thanks for the pattern and the diagram.